India is establishing itself as a key region for major brands using branded content as a core part of their marketing strategy. For this reason the BCMA India Chapter is being launched with the help of leading practitioners who will invite like minded professionals, passionate about building on the success of recent branded content campaigns to join. Karnvir Mundrey is the Chief Ideation Officer at Atharva Marcom. Karnvir’s journey in content started over two decades ago in the era of 2.4 kbps modems, when he assisted in creating one of the earliest Bulletin Board Systems (BBS) – in a pre-internet era! In the past Karnvir has been on all sides of the content ocean – be it print, electronic or digital. He was part of the editorial team at PC World India – India’s most popular technology publication, and engaged with global technology brands like Microsoft, Oracle, Yahoo, amongst others. His series of research papers, titled “Strategic Web Marketing”, were one of the first to explore concepts such as Return On Investment (ROI) in the digital space. Karnvir was also a Radio Presenter on All India Radio, conceptualizing, producing and delivering feature-rich programs. It is estimated that 64% of the 1.4 Billion population listen to the radio in India. He was the e-Strategist for a leading technology firm, creating one of the early online content solutions and bringing newspapers like the Times of India – India’s largest circulated English daily, to the digital age. He helped deliver one of India’s earliest Webcasts – for the Femina Miss India pageant, and helped pioneer the concept of data on phones – helping build one of India’s first phone data network – testing the grainy images on the early devices. Karnvir is the Founder and Producer of “The Health Tips Podcast” – India’s oldest and most popular online health show – also on iTunes. He was also the co-founder of “Analyzing Finance” – a Finance publication in London – which brought the academic and the industry together. 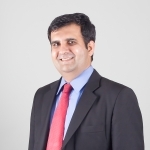 For the last few years Karnvir has been the Founder and Director of Atharva Lifesciences Consulting Pvt. Ltd. Atharva Lifesciences Consulting creates content in the areas of science. Atharva Marcom is a full service Public Relations firm, delivering strategic solutions for content and marketing. Karnvir is often featured in the media, for his views on the industry, and is on various committees of industry and commerce. He is a post graduate from the London School of Economics & Political Science (LSE), and is currently based in Bangalore, India.